No offense to Ravens head coach John Harbaugh, but from now on perhaps he should leave all of the talking in the Baltimore Ravens’ locker room to Ray Lewis. Seriously though, after hearing him deliver this motivational speech to the players on the Elon University football team, it is quite obvious that Lewis has a way with words. I was just sitting here working when I first heard this speech, and by the end of it I had to restrain myself from going outside and finding someone on the street to tackle. And if his words weren’t enough, how about the special effects in the background? 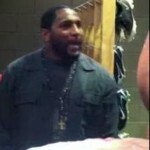 Thunder and lightning just going off as Ray Lewis shares his story with the team? Not even Steven Spielberg himself could have planned it any better than that.